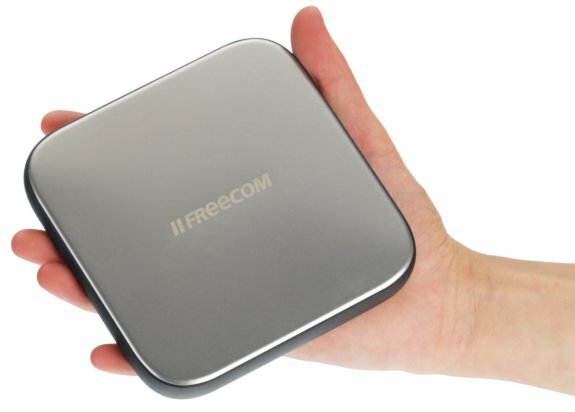 Freecom introduces the Mobile Drive Sq, a new portable hard disk with a square shape. The storage device was designed in cooperation with Arman Emami, a famed industrial designer. The Mobile Drive Sq measures 120mm x 120mm x 10.5/13mm, it has a stainless steel sandblased enclosure to prevent finger prints and scratches, and a plastic band to offer protection against bumps. Included with the device is a copy of Nero backup software and there's an energy-saving "Green Button" function that puts the drive in standby when not in use. Available in 500GB and 1TB capacities, the Mobile Drive Sq offers USB 3.0 suport to deliver maximum transfer speeds of up to 130MB/s. These disks will be sold for 99EUR and 149EUR, respectively.